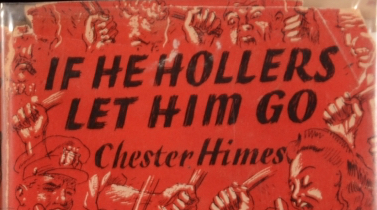 I’ve been working in earnest on Chester Himes’s 1945 novel If He Hollers Let Him Go over the last few weeks. His first published novel, If He Hollers… is set in WWII Los Angeles, and it focuses on Bob Jones, a black shipyard worker at the fictional Atlas Shipping. We follow Bob over several days as he experiences the complicated racial politics of wartime LA, and specifically the downward spiral of consequences that flow from him talking back to a southern white female colleague who abusively refuses to work alongside him. Himes’s writing career can be rather crudely divided into two halves: the two novels that came out of his time on the west coast during the 1940s, If He Hollers… and Lonely Crusade, and the ‘Harlem Cycle’ he wrote after leaving the US for France. The former are both concerned with industrial relations, race and sexual politics in 1940s Los Angeles; they are superficially realist in style, at least in comparison to his later work, and have often been analysed in relation to the protest novel form. The latter series was a conscious attempt to write genre fiction — Himes’s take on the ‘tough’ crime novel. The Harlem books are pitch black criminal tales threaded with absurdity and morbid humour; black NYPD detectives ‘Coffin’ Ed Johnson and ‘Gravedigger’ Jones are such fearsome and brutal figures that their role as the ostensible heroes of the series is rendered particularly ambiguous. Against this rather superficial summary, there is a good case to be made that Himes’s LA novels engage with the noir/hard-boiled tradition as much as they do the protest novel — as Nathanael Rich suggests, for example. My concern here isn’t to argue that they fit within a particular strictly defined generic category, although from the perspective of my research, I am interested in If He Hollers… as a Los Angeles-set narrative of incrimination in which the protagonist experiences moments of disorientation. In analysing Himes’s novel in relation to my other texts, though, I have been more and more struck by some fascinating parallels and common tropes. I will focus here on considering Himes and Chandler, although there are other interesting potential comparisons that need to be explored (such as Dorothy B. Hughes’s In a Lonely Place). I should also note that my own analysis of Chandler very much draws on these accounts, although on my reading, Chandler demonstrates that Marlowe’s investigative mastery, though bound up with geographical knowledge and automobility, is a precarious thing that is implicated with time and identity as well as space. What we should take from Chandler, I argue, is both the significance of the city’s segmented geography, and the limits of understanding the city in solely spatial terms. For all that this is an influential aspect of Chandler’s writing (and as importantly, an aspect of the subsequent critical response to Chandler), researching Himes further emphasises how important it is to contextualise such readings. The risk being that Chandler’s significance is overplayed, or that other contemporary voices are not treated to the same deep level of analysis. Jones moves, moreover, with his own highly sensitive understanding of the city’s social and racial nuances. Having followed a white colleague home to the Huntington Park neighbourhood, Bob reflects on the obtrusiveness of his own brief presence there, a black man in a white neighbourhood. He is even more conscious of this when he spends time in downtown Los Angeles, eating dinner with his partner Alice in an upscale hotel or attempting to visit a movie theatre. In the former scene he attempts defiance in the face of the racism he and Alice experience, and in doing so angers Alice, who is accustomed to repressing her awareness of such discrimination. All of this is interesting to me firstly because it suggests that the degree of city knowledge required for Marlowe to operate as a skilled private eye is not dissimilar to the degree of city knowledge that a black Angeleno might require just to be — to navigate the complex racial topography of midcentury LA. Smith again makes some powerful points that back up this reading, with his observation that in Jim Crow era Los Angeles, racism was not brutally overt as it was in the south, but it nevertheless existed and had to be discerned. It is this, in part, that makes Bob Jones’s experience an essentially Los Angeles one, and Himes’s novel such a significant LA novel. One of the central and most troubling questions the novel poses about Jones’s perspective on wartime LA society is: even if he’s right — that is, even if he perceives correctly, intuits soundly — would he be better off being wrong? Would he be better off, individually, if he saw less, ignored more, forgot more? This is exactly what Alice urges him to do, this is what the middle class African Americans such as her parents are depicted as profiting from, even though Bob is ultimately unable to assume a ‘thicker skin’ in the way society presses him to do — he can’t ignore the injustices and humiliations, and he can’t repress his anger and resentment. This question makes If He Hollers… fascinating to me because in it, the ethical and socio-political dilemmas of Jim Crow-era LA intersect with a trope — of knowledge being dangerous, and exposing the subject to greater risks — that runs from the hard-boiled detective novel (in which the vulnerability of the detective is fundamental aspect) to danger of ‘playing detective’ that is so significant in the films of David Lynch (and indeed, in the fate of The Big Nowhere’s Danny Upshaw, also arises in Ellroy’s fiction). Meaning that Bob Jones is not only a noir protagonist of the kind whose actions trigger a series of worsening and ultimately inescapable consequences; he might also be, through instinct and inner compulsion, a detective driven to expose crimes otherwise repressed and denied. David Fine, Imagining Los Angeles : A City in Fiction (Reno: University of Nevada Press, 2000). Chester Himes, If He Hollers Let Him Go (London: Serpent’s Tail, 1999). William Marling, ‘City of Sleuths’, in The Cambridge Companion to the Literature of Los Angeles, ed. by Kevin R. McNamara (Cambridge: Cambridge University Press, 2010), pp. 111–22. R. J. Smith, The Great Black Way: L.A. in the 1940s and the Lost African-American Renaissance (New York, NY: Public Affairs, 2006).